Wayne Gretzky, nicknamed "The Great One", he has been called "the greatest hockey player ever" by many sportswriters, players, and the NHL itself. He is the leading point scorer in NHL history, with more assists than any other player has points, and is the only NHL player to total over 200 points in one season, a feat he accomplished four times. In addition, he tallied over 100 points in 16 professional seasons, 14 of them consecutive. 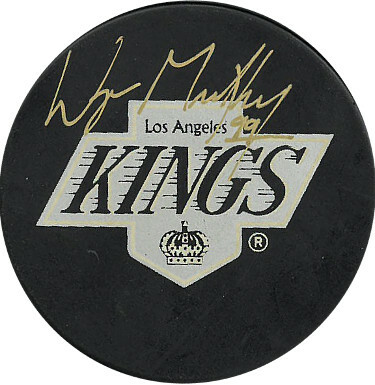 Wayne Gretzky has hand signed this Los Angeles Kings Logo Hockey Puck #99. Certificate of Authenticity from Athlon Sports Collectibles.